Teaches a winning approach to telephone collections. Vital techniques for collection agents to increase debt recovery. Comes with a ready-to-use Leader Guide for facilitating presentations. It includes keys to all exercises as well as related topics for instruction, discussion, and group interaction. Includes three Participant Workbooks (175 pages) that provide important background reading on each module, along with worksheets for all video exercises. 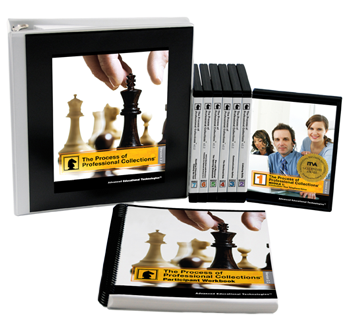 The Process of Professional Collections is a great investment for your company. Learn how to collect your outstanding debts and increase your profits!